A huge transfer from Ireland to southern Italy was not likely to go down particularly well among a peloton dealing with the countless stresses of riding a Grand Tour, so the organisers have tried to make things as easy as possible for them. A rest day has been set aside to allow everyone to travel to and acclimatise themselves in Giovinazzo, for the flattest and shortest road stage of the whole race. Four stages in and still no hills, this parcours is very un-Giro-like, but with so many big-name sprinters in the peloton it’s easy to see why the organisers have included plenty of early flat stages. Question is, will they all ride? 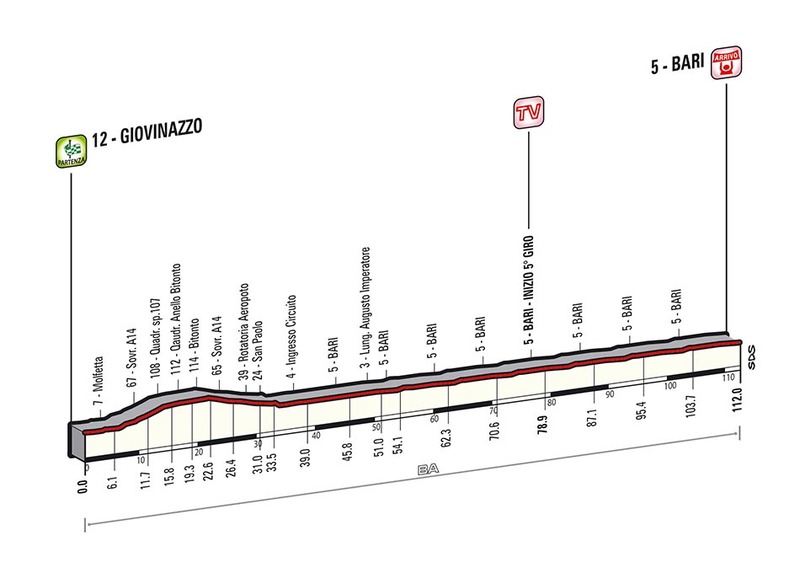 Stage four does look like the last straightforward sprint stage until the final day in Trieste, so the pressure to deliver will be on any sprinter who has not yet won a stage. Keeping us awake before the inevitable bunch sprint is the typically beautiful Adriatic scenery that adorns the stage, including the cities of Molfetta and Bitonto. The peloton arrives in Bari after just 40km of racing, at which point they will undertake eight laps around a circuit through the city. Bitonto hosted stage 10 at the 2010 Giro d’Italia, which was one of the few stages that year to finish in a bunch sprint. Tyler Farrar, who was in his pomp at the time, won, while Fabio Sabatini, Julian Dean, Robbie McEwen and Robert Förster rounded off the top five. Evidently, four years is a long time in cycling.